The human–animal bond contributes to well-being in a variety of ways. Our understanding of our relationship with animals, particularly from a psychological point of view, is enhanced when viewed through the lens of a lifetime developmental perspective. Issues of attachment and the nature of the human–animal bond vary across childhood, adulthood, and later life. These in turn influence how animals may play a role in maintaining physical and emotional wellness, influence recovery from illness, and even impact reactions to loss or grief. Persons at varying life stages may be differentially impacted by the loss of companion animals. 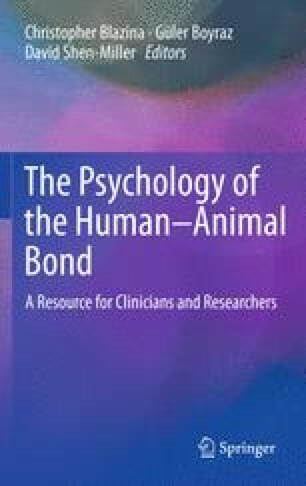 In this chapter both the unique and common benefits of the attachment to pets and resulting well-being at various developmental levels (e.g., childhood, adulthood, old age) are discussed. Specific populations and their unique relationship to animals (e.g. children with emotional distress, persons in nursing homes) are described to underscore how animals impact human lives across the lifespan.